For even the most seasoned traveler, that first time you step into the airport with a child is a little disorienting. All your usual routines are off, and now that annoying kid crying in line is yours! Well, forget about all the airplane drama for a moment. One of the most perplexing questions actually involves your post-plane plans: what do you do about those bulky car seats? Unless you are going to a big city and seriously only public transportation-ing it (and maybe even then), you’re gonna need a car seat. 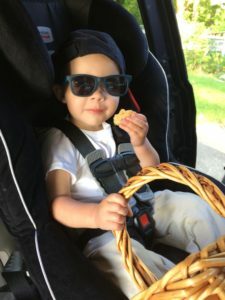 The car seat dilemma changes at every stage, too: the infant carrier stage, the bulky convertible car seat/still a lap toddler stage, the (easier) booster seat stage. I have experienced them all, so read on to find out how I answer the most common questions I get from my friends. Q: I am taking my infant on a plane soon, because I figure I may as well take advantage the fact that she can fly for free as a lap infant before age two. What do I do about that cute little baby carrier/carseat and its base? A: Congrats! That is the smallest and easiest car seat to worry about. Usually with a baby under 6-12 months, you will have a carrier-type car seat. Most of these are installed by clicking in to a base, but if you read the manual, most can also be installed using a seatbelt. It’s trickier — you must make sure it is at the right angle and snug enough — but there are videos online showing you how. With a little practice, you can become adept at car seat installation using just the carrier without the base, which makes it super easy to carry and install your baby’s seat in taxis, shuttles and rental cars. When I was traveling with a small baby, it was easy to use a stroller and carrier through the airport (yes, you have to put those through the X-ray machine at security, but the agents are usually nice about helping you) and then check them at the gate. It’s important to do this as soon as you get to the gate — just go up and ask for a tag — and then leave them outside the airplane door. When you arrive, they will be waiting for you just outside airplane door as you exit the plane.. 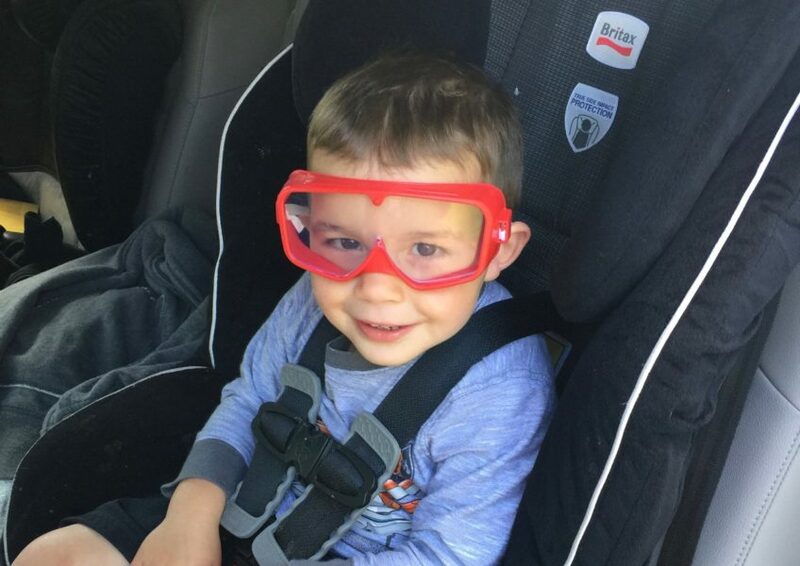 Nothing is more fun than riding in car seats during vacation…right? If you are super uncomfortable with installing your carrier-type carseat without a base, then you can check the base as luggage and retrieve it at baggage claim. Usually this won’t cost you anything as many airlines don’t charge for baby gear like this (check your airline’s policy), but you can’t guarantee it won’t get banged up in the process, and it’s kind of a pain. I would recommend just practicing with the seatbelt! Q: Help! My kid is too old for the carrier. Now I have a giant safe beast of a car seat in my car, and I can’t imagine traveling with it, or risking damage by checking it, but I will be in a car/bus/shuttle/taxi for at least a minute at my destination. What do I do? A: You check a car seat through luggage check. Some airlines (Alaska, I love you!) will give you a giant, thick plastic bag to put it in to protect it, or you can buy nice protective bags like this one. It will be waiting for you at baggage claim. You could also pull it through the airport in on of those wheeled car seat bags and check it plane-side if that makes you feel safer. Again, if your child has a paid seat on the plane, he/she can sit in it on the plane if you so desire. If you can handle that giant thing and your toddler at the same time through security, more power to you. I realize packing a car seat through an airport sounds terrible. There has to be a better way, right? I don’t think there is. If you travel frequently, consider buying a car seat that still has excellent safety ratings, but is cheaper/lighter/less frills than your regular car seat, just for travel. Q: But I want to put my kid in a car seat ON the plane. Like all good parents should. How do I get me, my kids, and The Beast of a Car Seat from my car to the plane? A: Great. Good for you. If you have a kid who will tolerate it, more power to you. You will have to pay for a seat for your child (rather than take your free lap-infant ticket for children under two). You can bring any size of carseat with you this way, and they make nifty wheeled thingamajigs to help you through the airport like this one. Don’t beat yourself up if you don’t really want to do this. If your kid screams every time you buckle them in, the flight is going be worse for everybody, and you’ll just spend more time walking up and down the aisles. This seems less safe to me than just sitting in the normal seat. Admittedly, when I was growing up, my siblings and I spent eight-hour flights rolling around on the floor under the seats, hitting other passengers’ ankles with Matchbox cars. I thought seatbelts were only there so you wouldn’t slide out of the seat on landing. So my perspective may be skewed. Q: What about traveling with booster seats? A: These are smaller and easier to travel with than those convertible car seats, of course. The principle is the same: put it in a bag (either your own or the airline’s plastic creation) and check it. The nice thing about booster seats is that they are always coming up with newer and sleeker ones. I’ve never tried inflatable ones like these, but they look like they’d be great for travel! This is the wrong way to travel with a car seat. It’s also the wrong way to drive. 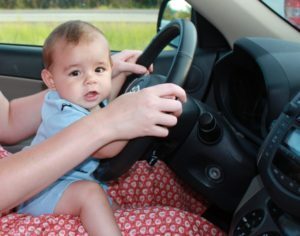 Just say no to baby when he asks if he can drive you to the hotel. Q: But I can just borrow a car seat from the rental car agency, right? A: NO. No no no no no no no. Do you seriously trust them to have a car seat available when you show up; have it be the right size for your child; guarantee it hasn’t been in an accident; and have cleaned any potential bodily fluids out of it? I’m not super uptight about most things, but this is a no in my book. I mean, what would you do if you got to your destination and they said, “Oh, sorry, the last customer just took our last car seat.” $%^#! Q: But we will only be in the taxi for like 10 minutes, that’s ok, right? A: Most state laws do not require car seat use in taxis (but California does, FYI), which seems like a law that’s good for taxi companies and bad for child safety. I’ll just recommend that you think through your journey thoroughly, as I have a terrifying and embarrassing story I don’t want to share that involves being convinced that it was no big deal to go between the airport and the hotel without a carseat, and then fearing for my child’s life every inch of the way. Q: But we will only be on a hotel shuttle/bus; you’re not going to make me drag my car seat all the way to Timbuktu just for that, right? A: Statistically these are slower and safer. I’ll leave this up to your discretion. Q: But we fly to grandma’s house all the time! Do I have to do this every six weeks? A: Awesome. Talk her into a buying a cheap but safe car seat to keep at her house. It’s probably worth the cost over time. Q: This sounds like waaaaaaay too much trouble. Should I just buy a car seat at my destination? A: I’ve heard somebody suggest this before, but it seems insane to me. How are you going to get to the store to buy it? You really want to be waiting at the airport while the other parent Ubers to Target? No no no no no. Any questions? Find us on FB and let us know what else you’d like to know about traveling with your little monsters!